Experience the ultimate in opulence with this exquisite Palazzo Versace Penthouse. A brand famous for its lavish sophistication, this penthouse boasts all the hallmarks of elegance synonymous with the Versace style, including hand-crafted marble mosaic and polished parquet floors, ornate ceilings with gilt detailing, three luxury bedrooms with marble ensuites and a gourmet kitchen with Miele appliances. Best of all, you’ll be enchanted with the sweeping views from the full height windows throughout, which perfectly frame the Broadwater and city skyline views. Boating enthusiasts will also appreciate the 25 metre private marina berth, with easy ocean access on offer. • 3 car spaces plus additional storage. One of only 6 penthouses in the ultra-exclusive, 5-star Palazzo Versace, this 2nd floor residence also affords you the privilege of access to the renowned dining, recreation and retail facilities on site, including 24-hour security, room service, a fully equipped gym plus indoor and outdoor pools, poolside cabana’s, day spa and fitness centre. You are also only less than a minute walk to the upscale Marina Mirage designer shopping and dining precinct and 3 minute drive to the cafes and boutiques of Tedder Avenue, Main Beach. Gold Coast Airport is located approximately 35 minutes south with Brisbane Airport an hour away. 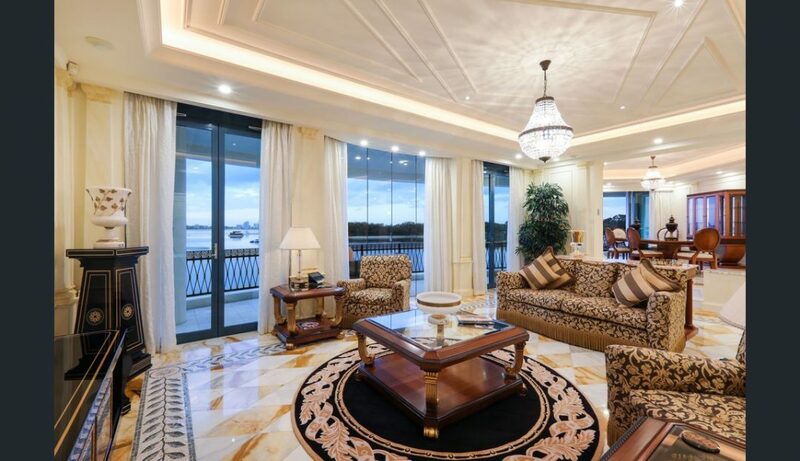 Indulge your senses and arrange an inspection of this luxury Palazzo Versace Penthouse today.